Radlink can provide a complete, engineered solution for your RFID needs. From tags that are required to operate in the harshest of environments, through to small, credit card sized cards, we can then provide the communications link and back office solution to display your RFID data. Identification of personnel, packaged goods, inventory control, logistics support, tracking, access control, livestock, asset and inventory management. 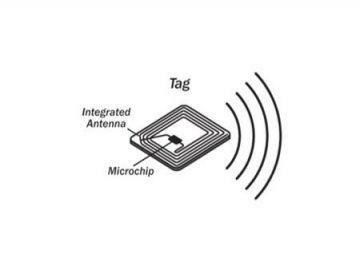 Radio-Frequency Identification (RFID) uses radio waves to both read and capture data stored on a small tag that is attached to an object or animal. They are sometimes referred to as ‘beacons’ tracking the real time location of assets and are most commonly seen in ‘high speed’ environments such as tolls and rail cars. While they do offer many advantages over the passive RFID, they do require their own power. A passive tag can be read over distances up to a few metres away and do not need to be within direct line-of-sight of the reader to be tracked. Typically they are used for short range readings on high volume assets and inventory. Another advantage of a passive tag is that there are no batteries to change, being powered by the electromagnetic energy transmitted from the RFID reader. They can be ruggedized for the harshest environments and are significantly cheaper than active tags. Regardless of the type of RFID tag used, a reader will need to be used in conjunction with the tag. The reader collects the data and information from the RFID tag and then either stores this information or transmits it to the client.